Four days after the media launch of Ghana’s readiness and optimism towards grabbing an Olympic Gold medal at the 2020 Tokyo Games; some prospective sponsors have responded positively to the call of the Ben Nunoo Mensah in relation to the 2018 Commonwealth Games in Australia. Cocoa From Ghana, the official headline sponsor of Ghanaian sportmen and women at the 2016 Rio Olympic Games and 2018 Winter Olympics in PyeongChang has agreed in principle to support Team Ghana at the 2020 Tokyo Games. They have however promised to support three disciplines namely; track and field, boxing and volleyball. 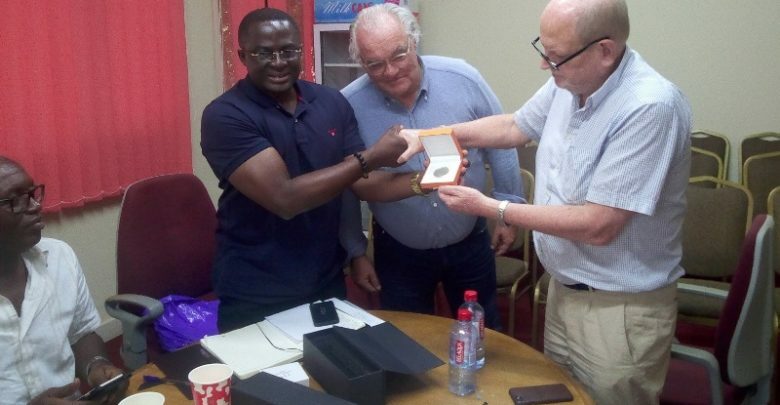 On Tuesday March 6, 2018, officials of Cocoa From Ghana held an important and fruitful meeting with the Ghana Olympic Committee [GOC] executives, and after the discussions, Mr. Ben Nunoo Mensah presented some souvenirs from the 2018 Winter Olympics to Cocoa From Ghana. They also gave to the GOC, a digital collection of exciting moments at the Rio and PyeongChang Games.Mr. Henri Wientjes thanked the GOC for letting them be a part of the success story of Ghana’s skeleton athlete, Akwasi Frimpong. Joost Bellaart and Edwige Dessein other representatives of Cocoa From Ghana also prayed that the relationship would be of mutual benefit. Mr Ben Nunoo Mensah commended Cocoa from Ghana for responding to their call. He assured them that the funds would be used for its intended purposes and also agreed to partner them for the growth of sports in Ghana. Other GOC members present were the General Secretary, First Vice President, Treasurer, Assistant Treasurer, General Secretary of the Ghana Athletics Federation, President of the Ghana Boxing Federation and Jerry Ahmed chef du Mission to Pyeongchang 2018 Winter Olympic Games.